Ask yourself what are your priorities. Are you travelling just for the sake of going to these countries or do you want to experience their culture too? Are you a backpacker or travelling with your family or friends for leisure? Is the accommodation a priority for you or is it okay for you to stay in a hostel or a dorm-type room? 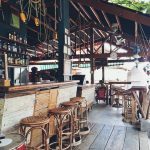 Is the location big deal for you? Do you prefer near the markets or you prefer a cheaper location but kinda far from the center? Do you want to try Vietnamese cuisine or you’re fine with packing your own food? Is shopping a priority for you or you only need few souvenirs? By asking these questions you know how to allot your budget accordingly. If you read my post, I mentioned that we booked our hotel through Booking.com and we opted to stay in an affordable place in Vietnam and splurge a little in Cambodia. If you want to save more on the accommodation, pick an accommodation that fits your budget. There are a lot of accommodation in Booking.com that you can choose from. The hotels that we booked are only suggestions. In the breakdown of cost, I also indicated that my shopping budget was Php6,000 and I bought A LOT of things. So, your budget for shopping totally depends on you. Souvenirs in Vietnam and Cambodia are cheap, it is a plus if you’re good at haggling (I’m not very good with that). You will be the one to determine how much you would allot for shopping, and since this is not entirely considered as a necessity, I suggest whatever is left from your budget after you spend for accommodation, food and transportation, you can allot it for souvenirs. One of my tips is bring your own food, you can bring canned goods or chips that will prevent you from impulsively buying food when you’re hungry. By doing this, you can save a few peso. If you will notice I only spent 10,200.15 for the travel tax, accommodation and activities. Below is my suggested allotted money for food, transportation and souvenirs, WHICH is flexible depending on your budget. You can cut-off souvenirs to 3,000. Then for food, if you opt to bring food then cut it to 2,000 then for transportation, if you don’t mind walking around, you can avoid taking cabs, which can lessen the budget, say allot 1,000. 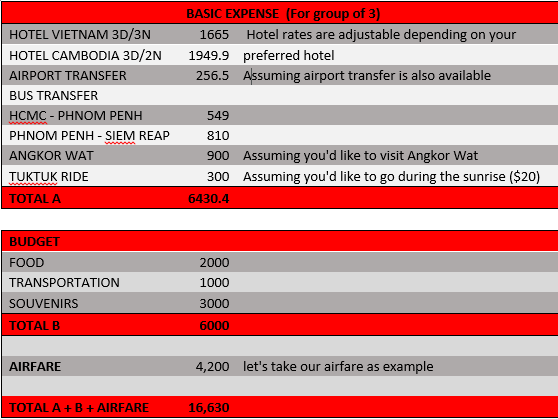 This is the most basic itinerary, then you can just adjust the budget depending on your preference. Hotel amount can also change if you prefer cheaper accommodation. 2. How many are you in a group? We were 3 when we did the Viet-Cam. Of course, we all know that the bigger the group, the cheaper the “hatian” will be. If you’re 2 or 3 in a group, then focus on the other things you can budget. We booked our tickets on two different dates. We first booked our Manila to HCMC through Cebu Pacific. It was December 2014, we booked a flight for July. We already know that we will do a cross country, but we don’t know yet how long we want to stay in each country. So we only booked one way for less than 1,500. We then decided to spend 3 days per city. So when the next seat sale came, we booked our Siem Reap to Manila. Point # 2: Some people did Tri-Country or more with the same budget or a little higher. First, I am an employee and I cannot afford to use up all my VLs for a Southeast Asia trip. I can only file a leave for a week (including the weekend). 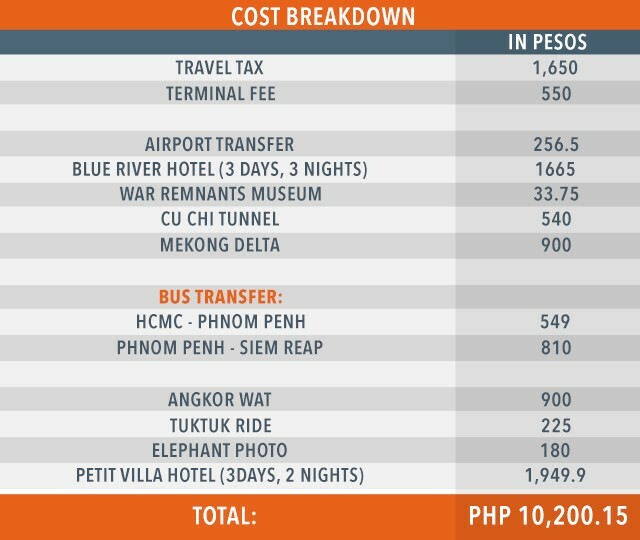 Second, it is definitely possible to do a Vietnam-Cambodia-Thailand in a span of a week on a budget. We considered that but we preferred not to do it. I just feel that there’s so much more to do in Thailand that we can’t squeeze it in a day or two. I personally plan to visit Thailand during Songkran so it’s hitting two birds with one stone: visit the country and join the festival (I love festivals!). Again, it depends on your priorities. If you want to do the tri-country, yes it is possible with that budget, but I hope you don’t feel bitin. Point # 3: Riding the elephant. I am really sorry about that. But at that time, we didn’t know that riding the elephant causes them stress. We thought it was good to try it since I don’t think there is an opportunity to ride an elephant here in the Philippines. Good thing, we only did a photo op with the elephant and we did not actually ride it. There is a separate price for just taking a picture ON an elephant and actually RIDING THE elephant. Rest assured that I will not suggest it to other people who will be visiting other Southeast Asian countries. Hi again! I got the answer to my question here. 🙂 I appreciate your tip on booking your plane tickets on separate dates. Thanks for the tip, especially this –> most of the time when you book a roundtrip ticket, one way is cheap and the other is expensive.